Central Arizona girls Aleeza Kanner of <?xml:namespace prefix = st1 ns = "urn:schemas-microsoft-com:office:smarttags" />Phoenix, Alexandra Letzt of Scottsdale and Madison Clarke of Phoenix each fared well at recent USTA National Open Girls 14 events held across the nation, Feb. 14-18. USTA National Opens are held five times a year, and are just a notch below the four junior Grand Slam (USTA Hard Courts, Clay Courts, Winter Nationals, Spring Nationals). El Paso's Youth Tennis Center hosted a Boys/Girls 14's National Open, with Kanner, paired with Hailey Rochin of Tucson, winning three rounds of doubles and reaching the finals before falling to top-seeded Brooke Austin of Indianapolis and Katrine Steffensen, of Scarsdale, N.Y., 8-2. Further east in Lake Charles, La., Letzt made it to the semifinals and added a doubles final result, partnering with Maria Smith of Houston. 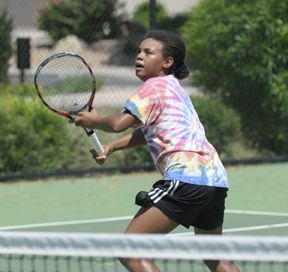 Finally, in Claremont, Calif. at a combined Boys/Girls 12's and 14's event, Clarke reached the quarterfinals in singles, and also took third place in doubles, teaming with Nora Tan of Mercer Island, Wash. Congratulations to our Central Arizona girls!